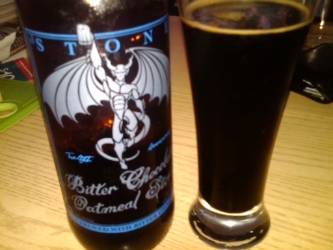 oatmeal stouts are tasty… and this is no exception… this is over the top flavor in a glass. you get some beers that say one thing on the label and it tastes nothing like that… but this actually does taste like bitter chocolate (like baking chocolate) and oatmeal. and being a stout, there were flavors of coffee as well. i would definitely get this again… i wonder if it’s still being sold? only one way to find out — i need to make a trip to my local stone brewery! sweet, keep drinking, stay thirsty my friend.